The Flinders University Community Permaculture Garden was established in 2001 by friends of the Flinders University Environmental Action Group (FEAG). Since its inception it has played an important role in fostering student leadership, knowledge and learning regarding sustainability, permaculture and environmental awareness on campus and within the broader surrounding community. The community garden is approximately a 2000 square meter site adjacent to the Sturt precinct, and features a fruit tree orchard including rare fruits and nuts, vegetable gardens, water-wise catchment systems such as swales, compost facilities, and a native regeneration project. The garden is constructed according to Permaculture principles, a design system and philosophy which encourage sustainability and resilience, covering topics from food source to energy generation. Permaculture promotes diversity, multi-use, high yielding, edible and indigenous landscapes, whilst nurturing human health and interaction. We advocate and introduce visitors to the principles and practices of permaculture and other sustainable lifestyle techniques through interactive workshops. For example organic vegetable gardening, native re-vegetation, mulching, composting, eco-design and planning, material sourcing, as well as community development activities through open days, working bees, garden tours and information sessions. Over the years the Flinders University Community Garden has matured and flourished, it is now one of the longest running community garden in South Australia and will continue to play an important role now and into the future. There are a lot of amazing people who have contributed to the garden over the past 12 years, that all deserve acknowledgement. The garden was founded by Andrew Rettig, Beque, Christopher Day back in 2001. There are a lot of amazing people who have contributed to the garden over the past 12 years and these are just a few who deserve to be acknowledged and these incredible garden loving folk have really helped to enliven the garden over the years. So big thank you to Christopher Wood, Brett Thompson, Katherine Negrin, Bridgett Toner, Hannah Maloney, Kelly Allen, Peta Page and soooo many more. The garden has special place in the heart of hundreds who have helped develop the space over the years. It has grown to be a incredible space for cultivating community through hands on permaculture. With out the collective contribution of all volunteer club members the garden would not be as incredible as it is today. 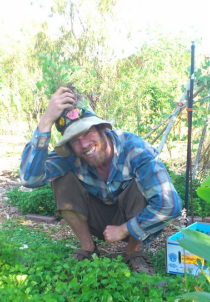 Kegan Daly is the current President of the Flinders Community Permaculture Garden and is part of our project team. 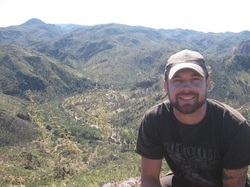 Kegan is passionate about permaculture and ecological building. A qualified horticulturalist, permaculturalist and nature-worshiper, Kegan is currently studying a Bachelor of Arts majoring in environmental politics and sociology. For the past year he's worked for House of Bales, Adelaide's leading straw bale builder, as a mud monkey and bale handler. Next year he's setting off to Taos, New Mexico to learn the art of Earthship construction with the intention of returning to Australia to help construct these radically sustainable houses. On weekends, Kegan is renowned as a revolutionary rat-bag hosting Whats Up Doco at Mad Mouse Alley and moonlights as a crazed metal lead singer for Funeral Moon and Space Bong. Lizzie joined the garden at the beginning of 2013 in her first year at Flinders as a way to unwind and relax within nature. This year Lizzie has enjoyed working with international activists on campaigns and volunteering with the Wilderness Society. Lizzie understands the importance of native gardens and coastal vegetation as she is also a surf life saver. Lizzie is studying education and hopes to an educator in rural Australia, working with Indigenous Australians and learning how to live off the land whilst living sustainably! Lizzie won a 2012 Order of Australia for her social justice and environmental activism work within schools. TJ is loyal garden club member and is helping to project manage this project. For the past 11 years she has been employed as the Community Outreach Coordinator for The Wilderness Society (South Australia) Inc where she has helped to deliver some of the most significant environmental outcomes in South Australia. TJ has had a colorful history within the environment movement across Australia for over a decade having been involved in many successful environmental organisations and campaigns. She is a mentor and activist educator for many young activists across the country and is deeply committed to nurturing and encouraging the individual growth of others. This year was acknowledged for her dedication to our environment and sustainability as a finalist in the Pride of Australia Medal Awards. In her spare time she is a loving mother. Sarah has always been a nature lover and loves digging in the dirt, being barefoot and surrounded by greenery. She draws creative inspiration for her work with children, from the natural world. 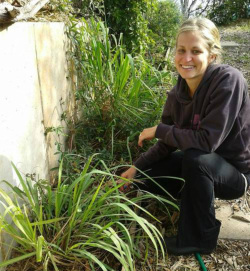 Originally from QLD, Sarah came to Adelaide in February 2013, and joined the Flinders garden in her first week here! Sarah completed a permaculture design certificate in 2007 at the Eumundi Bamboo Forest with Janet Millington. 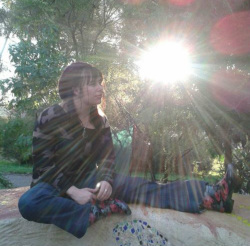 She fell in love with the philosophy of Permaculture and feels passionate about the Permaculture design system. Sarah spread the perma-love and knowledge with international student groups, while she worked as a leader for International Student Volunteers (ISV) on conservation projects around Australia. Christopher Day has a long history with the garden being on of its founders, he has now started his own business 'Every Day Sustainable Living', which establishes and installs organic edible gardens and landscaping. Christopher received his Bachelor Degree in Environmental Science in 2004. His journey in Permaculture, Organics and Education began in 2001, when he co-founded the Flinders University Community Permaculture Garden. He has since immersed himself in every aspect of Permaculture/Sustainable Living, and practices it in his daily life. There are a lot of amazing people who have contributed to the garden over the past 12 years and these are just a few who are still actively involved. The garden has special place in the heart of hundreds who have helped develop the space over the years. It has grown to be a incredible space for cultivating community through hands on permaculture. 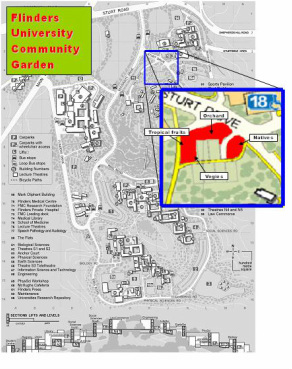 The Garden is located within Flinders University property.